Corporate e-learning has now become ubiquitous and has been with us for the last two decades at least. Learners and tutors are now well aware of the fact that training for corporate practices is much more efficiently carried out using e-learning as opposed to instructor-led classroom courses for several reasons. While it makes the lives of tutors easier by cutting down costs and efforts invested, it’s doing more good for learners all across the globe in the development of quality learning and training content especially via training games. The key advantage of imparting training games on various concepts via corporate e-learning tools, on multiple platforms and devices, is that it ensures tutors are in sync with modern-age learners, thus delivering the type of content they want, when they want it. Moreover, digital learning is self-paced learning that can be accessed at the point of need, not somewhere more tedious, like a classroom far away. So even working professionals can learn more easily- at comfort and apply what they’ve learned straight away. Compression of learning time within a simulation to show cause-and-effect patterns that would take months or even years to learn otherwise and hence, calculating the perfect seat time for a given course is extremely crucial and it is particularly important if you are designing corporate training deliverables because it will give you a general idea of how much time an employee requires to set aside from their work, in order to complete their interactive training. The seat time is the time it takes a learner to complete a corporate e-learning course from start to finish. 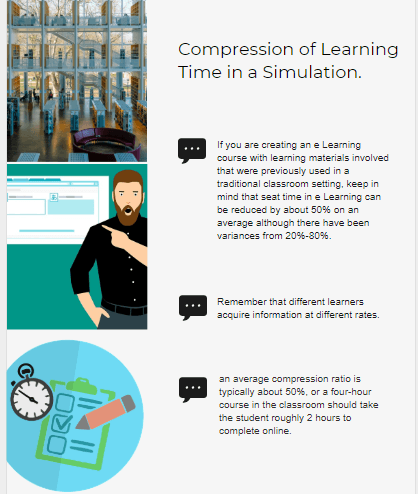 If you are creating an eLearning course with learning materials involved that were previously used in a traditional classroom setting, keep in mind that seat time in eLearning can be reduced by about 50% on an average although there have been variances from 20%-80%. Of course, this greatly depends upon the types of corporate e-learning activities you integrate and the nature of the subject matter particularly. However, as a general rule of thumb, eLearning can accomplish much more in a shorter amount of seat time. Consider the nature of your given corporate e-learning activities. When trying to calculate the seat time of your corporate e-learning deliverable, you will need to consider the type of eLearning activities you’ve included. For instance, if your corporate e-learning course needs to teach learners a new skill, then they would probably benefit more from interactive scenarios or simulations, even though this would take more seat time than just reading the text with the instructions. Remember that different learners acquire information at different rates. No two learners are alike. Just as every learner will respond differently to various eLearning activities, so will they acquire and absorb information at different speeds. While one learner might complete your eLearning course in half an hour, another might take 45 minutes to make his/her way through all of the modules. Therefore, it’s important to get a diverse group of individual learners involved in your immediate focus group. This will allow you to calculate a very precise seat time estimate that accounts for different learner behaviors and needs. Use these tips for calculating seat time in corporate e-Learning to figure out just how long it will take your learners to complete your eLearning deliverables, while also ensuring that you could offer effective and meaningful eLearning experiences. Learners can focus on elements of a programme they need to learn and can skip what they already are aware of. Certain training like compliance training, policy training, some part of Induction etc. where the main goal is to deliver standard information, corporate e-Learning can not only reduce the time required to train the people but also release pressure on the trainers. In a study conducted, Compression ratio: What would the length of the course be if it were online vs. classroom based? There’s generally been a lot of research on this, and answers vary anywhere from 20% to 80% of the original length, but there’s general agreement that an average compression ratio is typically about 50%, or a four-hour course in the classroom should take the student roughly 2 hours to complete online. A study found that, on an average, implementation and provisioning of e-learning courses consumed approximately 85 percent less energy and produced 80 percent lesser carbon monoxide emissions per learner, in comparison to traditional and conventional classroom-based university courses. Therefore, at Indusgeeks corporate e-learning combined with high fidelity learning/training simulations to improve your training outcomes by reducing the training time required (for both learners/trainers and consequently, reduces the overall costs as described in this article).